Fungi in all its strange shapes and sizes. Fungi are a huge group of organisms, distinct from both plants and animals. They range from microscopic through to quite large mushrooms. Many fungi are edible, yet others are poisonous. 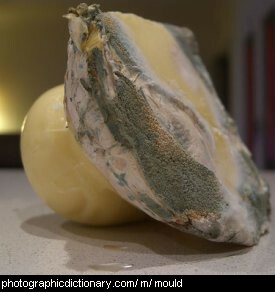 Some fungi is used to flavour cheese, make antibiotics, or make yoghurt, while others are seen as mould when food goes rotten. Most fungi live on dead and decaying matter. 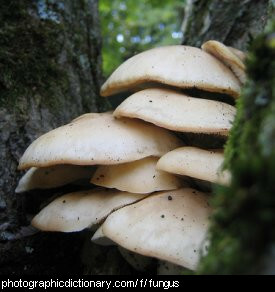 The singular of fungi is fungus. Moulds, also spelt mold, are a kind of very tiny fungus that grow into filaments, or strands. 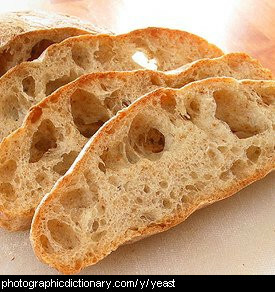 Mould is usually thought of as something that grows on food when it goes off and starts to rot. The picture is of some mouldy cheese. 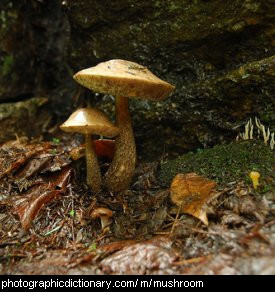 Mushrooms are a type of fungus, and are not a plant. They come in a variety of sizes and colours. Some mushrooms are edible, but others are poisonous - poisonous mushrooms are often called toadstools. The top part of a mushroom is called the cap and the stem at the bottom is called the stalk. Mushrooms reproduce in a similar way to ferns. They grow spores in gills under the cap, which gradually opens from a ball to a disc as the mushroom matures. Some mushrooms release their spores in an explosive puff. Spores look like fine black dust. 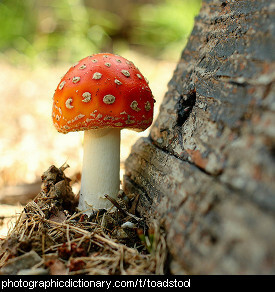 A toadstool is a poisonous mushroom. Toadstools usually have very curved caps on top of them, like a half-opened umbrella.